Gwen Shamblin was born and raised in Memphis, Tennessee, with a strong faith and foundational values. She grew up with a medical background, making rounds with her belated father, Walter Henley, M.D., who was a General Surgeon. She received her undergraduate degree in Dietetics and Masters Degree in Nutrition with an emphasis in Biochemistry from the University of Tennessee in Knoxville. Mrs. Shamblin was an Instructor of Foods and Nutrition at the University of Memphis for five years, and she worked with the city's Health Department for an additional five years, helping specifically in the areas of overweight, obesity, pregnancy, and child health. A very spiritual person with a strong faith in God, Mrs. Shamblin felt led to found The Weigh Down Workshop in 1986, in order to teach these principles to those who were desperately seeking to lose weight permanently. Initially offered through audiotapes and small classes taught by Mrs. Shamblin in a retail setting, this teaching began yielding unprecedented results. Participants were not only losing their weight while eating regular foods, but they were using the same Bible-based principles to turn away from other addictions such as smoking or alcohol abuse. By 1992, word had begun to spread about Weigh Down, and churches from all over the country asked if they could host Weigh Down seminars for their church members. The program was packaged for seminar use, churches began to sign up, and the media began to pay attention. The growth was explosive. By the late 1990s, Weigh Down was internationally known in most Protestant, Catholic, and Evangelical churches. Gwen Shamblin and The Weigh Down Workshop was featured on such shows as 20/20, Larry King Live, and The View, as well as in such magazines as Good Housekeeping and Woman's Day. 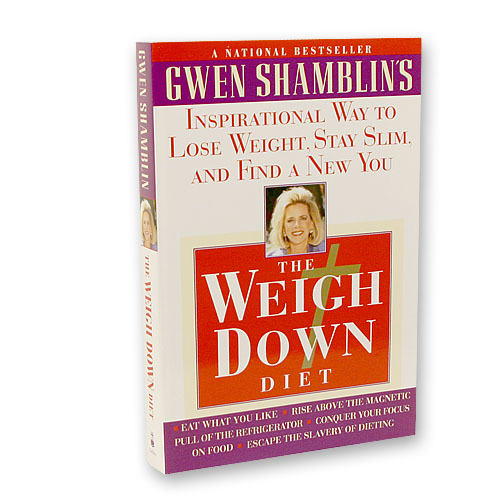 In 1997, Mrs. Shamblin responded to the nation's request to offer the Weigh Down principles in book format, and The Weigh Down Diet was published by Doubleday, Inc. The book quickly became a million-seller as people discovered the secrets to losing weight quickly and permanently while finding a new relationship with God. Feeling led to go even further in helping others to live fully for God, in 1999, Gwen Shamblin, along with other individuals who shared her passion for God, founded Remnant Fellowship Church. Remnant Fellowship Churches are now found in over 100 cities worldwide where members hear convicting and encouraging messages of the importance of putting God and His will first in your life. Twice-weekly church services are webcast live from the original Remnant Fellowship church located outside Nashville, Tennessee, built using her own personally donated funds. The dream of helping people turn away from the love of food and toward a love of God has turned into a ministry. Through Remnant Fellowship and the Weigh Down Workshop seminars, hundreds of people are helped daily as they break away from the pain of obesity and other addictive substance or destructive behaviors. Mrs. Shamblin is continually producing new materials for both the church and the Weigh Down Workshop, yet she takes no salary for her efforts. Funds that are received through the sale of Weigh Down products and seminar fees or through donations to the church are used to support each respectively in order to help hurting people of every nationality discover the love of God that can set them free. Gwen Shamblin has been married to David Shamblin for well over 20 years. They have two grown children who are married and who reside with their spouses and children close to the Shamblins' home in Brentwood, Tennessee.